"Aztec is the largest llama on our farm. He weighs about 500 pounds." Image courtesy of Rosemary Fell. This is the third instalment of BNN Bloomberg's five-part series on odd jobs and the Canadians who work them. Rosemary Fell never intended to get into the shearing business, but she's happy she did. Fell is a custom shearer of llamas and alpacas, which belong to the camelid family of animals that also includes guanacos, vicuñas and camels. Fell, who lives on a farm spanning more than six acres in Denman Island, B.C. 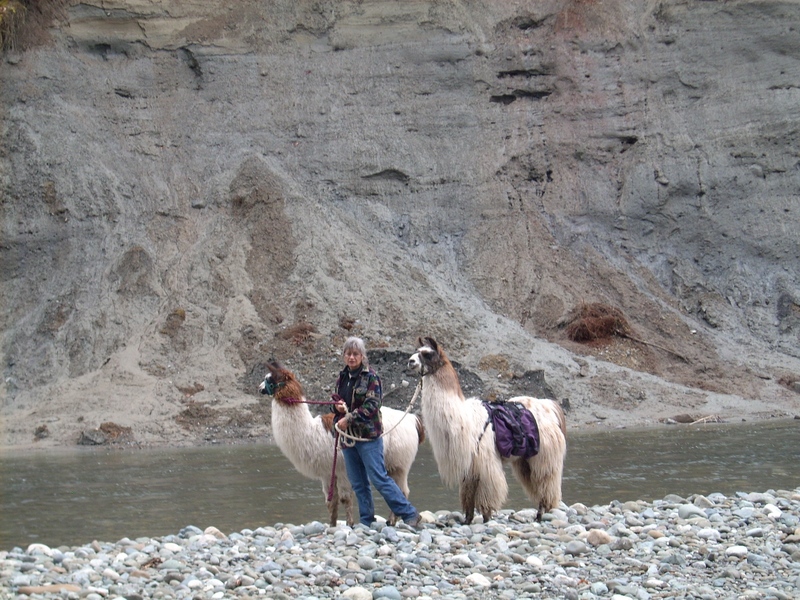 with her husband, four alpacas and eight llamas, came into the niche profession "out of necessity" in 2001 when she acquired a few camelids and couldn't find anyone to shear them. So she bought shears, enrolled herself in courses and began grooming them herself. Before long, word spread, and Fell left her front-desk job at a marine-propeller shop to commit herself to the trade. Fifteen years later, Fell, now in her sixties and semi-retired, is still at it, travelling to small farms throughout Vancouver Island, the Gulf Islands and Powell River on the mainland to shear camelids (and sometimes Angora goats). Since a "good season" of shearing generates only about $15,000 of income for the year, Fell says she services the entire supply chain to "help buy hay." She not only shears the animals but also processes the fleece and turns the material into products like hats, duvets, shawls, gloves and socks. She also trims camelid toenails, maintains hooves and volunteers as a rescue coordinator, finding homes for llamas and alpacas who need one. Fell is one of many Canadians who have made an entrepreneurial leap into off-the-beaten-path careers while workers move into self-employment amid a disparate labour market. Below, Fell explains why she loves what she does and waxes poetic on the majesty of her fleecy friends. Q: How much does the shearing service cost? A: The industry standard to shear a llama is between $25 to $35. It's around $20 to shear an alpaca, for the whole animal. Isn't that something? When I take my poodle in to have her clipped, it costs me $80. She has to be clipped several times a year, whereas a llama or an alpaca, it's once a year and in some cases, once every two years. When the animals get older their fleece does not grow as fast. Q: How long does it take to shear the animals? A: An alpaca, less than 10 minutes. A llama, 10 to 15 minutes. But it depends on the animal and how well-behaved they are. A: It's very seasonal, because you don't shear animals during the winter months because they have to be completely dry. Generally I start shearing in late April, really May, and the season usually doesn't run any later than August, because you want the animals to have a sufficient coat to keep them warm in the winter. August (Gus for short). "This little llama may be short in stature but he's got a big llama attitude." A: Working with this type of animal. They're intelligent, they're beautiful, they have a wonderful byproduct being their fleece. They're very efficient with their food source: They don't just eat grass, they eat shrubs and blackberries and salmon berries, so they're very good as far as keeping your farm neat and tidy. And it's nice not to have backpacks on the trail — let them carry it. If I have one regret, it is that I wish I would have started this occupation at a younger age. I've never enjoyed a job as much as I do working with camelids. Spirit and August on an adventure along the Oyster River on Vancouver Island. Q: What is the most challenging thing about what you do? A: Llama and alpaca shearing is not for the faint of heart. It can be dirty, dusty and sometimes you may have to deal with unruly individuals. Not every camelid is well-trained. The hours can be long, and your schedule can be totally buggered by a change in the weather. "This is one of my favourite llamas. Her name is Natalie. She's an old-style pack llama. Excellent genetics, calm, easy to work with, and has striking markings." Q: What's something surprising about alpacas and llamas? A: I don't think people realize how very intelligent they are. You only have to show them how to do something a couple of times and they remember. They also have a memory like an elephant. They'll remember you even if you haven't seen them in 10 years. They will also remember if someone has done something bad to them. I've rescued animals that were mistreated and it takes a long time to rebuild their trust. Missy and her cria (baby llama) Buckwheat. This interview has been edited and condensed for clarity. All images courtesy of Rosemary Fell.